For better or worse, ’tis the pumpkin spice season, permeating everything from your classic pie down to your latté. Now I love me a good pumpkin pie, but I’m often left with a half-used can of pumpkin purée afterwards. 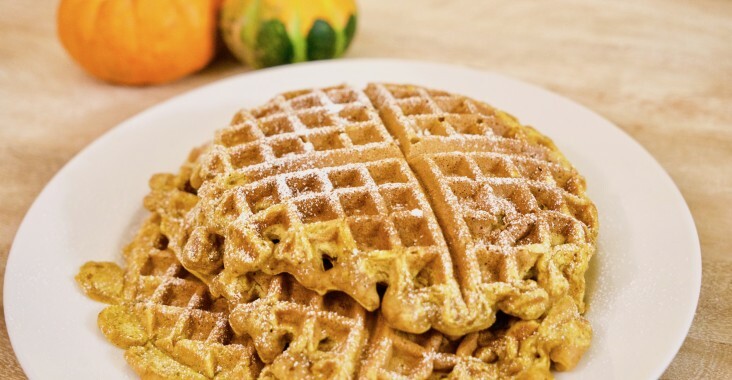 I had a bit of a craving for breakfast-for-dinner, and thought, why not put that pumpkin to use? In a large bowl, thoroughly stir together dry ingredients. In a medium bowl, whisk eggs, milk, syrup and butter together before stirring in the pumpkin purée. Add the wet ingredients to the dry ingredients and mix until just combined. Bake waffles in preheated waffle iron until crispy on the outside. What a quick and easy dinner to make! The batter came together in know time, and baked up in the waffle iron with relative ease. Though because of the pumpkin purée, achieving that crispy texture was a bit of a challenge with my iron. So after all the waffles had all been cooked up, I finished off the ones I was going to eat in the oven for 5-10 min at 250 F. The waffles had a lovely pumpkin spice flavour (it smelled divine when cooking! ), and with a little maple syrup drizzled on top, were a perfect slice of autumn.